Ontario Fishing:Fishing Classifieds & more! Avid Angler: Free Power Fishing Link Page! My Collectibles site:Take a look! Although I have caught almost every type of freshwater game and panfish that swims, my favourite fish to pursue most of the time is the bass. Largemouth or small, I love 'em all. I grew up on the small jawed variety that lived in the clear-water lakes in the Sudbury area of Northern Ontario. There were plenty of trout to be caught in the streams up there as well and THAT was my finesse fishing, learning curve, at it's best. Trout possess the four S's essential to their life. Trout are Smart, Spooky, Skittish and Shy. :-) They are a real challenge to land usually too, unless you pretty well know what you're doing. Native Brook Trout are also very fragile as well. They do NOT handle pollution at all. I always feel very privledged to fish for and catch these beautiful little fish in their native environment. As in all my fishing, I release over 95% of the fish I catch but I must say here that I have certainly eaten my share of impaled on a stick, open campfire cooked, Brook Trout, over the years. Each spotted beauty seeming to be flavored even better than the last. Right down to the cooked crispy, bacon like fins. So beautiful, so healthy and oh so tasty...Can't you just smell them broiling over that little stream side fire? A Moss Bossed Bass, by Bourgeois! Still, for the sheer RUSH of it all, even after all these years, it is the actual VISUAL attack of a marauding largemouth bass at the surface, that it's all about for me. Swishin' a Zara along at a fair pace or Gurgling a triple blade buzzer at a decent clip, can and will provoke AWESOME explosive charges from very hostile bass. It won't take too many of these WILD ATTACKS for you to get hooked on this exciting form of fishing too. I can GUARANTEE it!!! !Even when you don't get a good hook up, the excitement level going on during one of these crashing, smashing strikes are definetly adrenaline pumping stuff and could even be cause for a heart attack. Yup. Yup. Bassin' is not really a sport for wimps but it can make boys out of the most hardened and talented professional fishing men at times, to be sure. It's Still Man's Favorite Sport! Do you want to visit some of THE Smartest fishin' folks in the world? Then just click the banner-link below! This lure has been in my tackle box for over 40 years. The reason? It works! 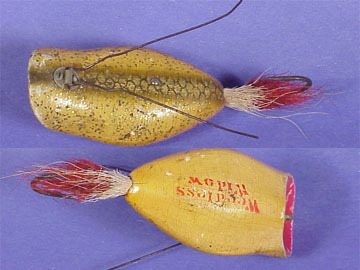 Make double sure you have a few of these long-time, killer, Finnish Wablers, in Your tackle box! Thanks for surfing by, fisherman Please take a cast in here again!